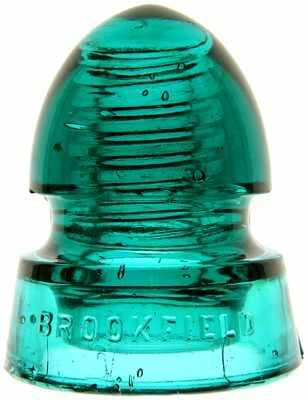 Lot 92: CD 149 BROOKFIELD Color: Rich Deep Aqua Description: The sharp upper wire ridge is prone to damage; this example has only a couple of 3/8" flakes, otherwise about very near mint. These are much harder to find than their unembossed counterparts, one of which you can see in lot 93. The 1907 Stuart-Howland Catalogue calls this insulator the "Burbrook" Extra Deep Groove Double Petticoat. The origin of this name, whether person or place, is unknown, but it's hard to find one in better condition, so add this "Burbrook" to your collection!